An all-white space can feel bright and modern. But, let's face it, it can also feel a little boring. 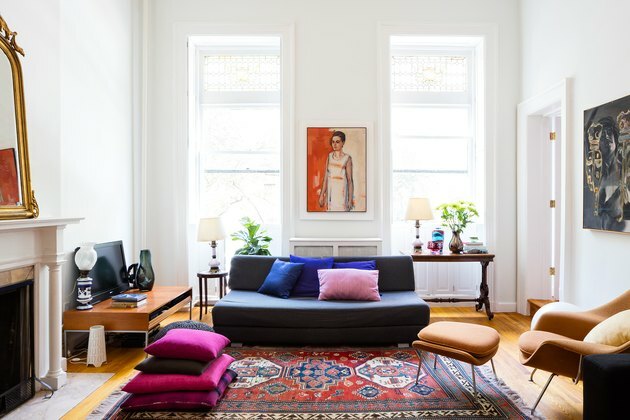 After living in a small, immaculate space in lower Manhattan, architecture professor Ioanna Theocharopoulou was ready to bring color into her next home. An architect by training, she joined forces with MAN Architecture and Hatchet Design Build to make over the new loft in Brooklyn Heights that she shares with her teenage son. "[Ioanna] wanted something that had somewhat of a more Mediterranean feeling," says Hatchet Design Build project manager Eric Springer. The space itself had amazing period details, but needed some serious reorganization. The firm rearranged the central core of the apartment to create a functional kitchen for the avid cook and entertainer and added storage underneath the staircase. Theocharopoulou picked out cement tile to accompany the custom white cabinets and chose bold wall colors for the bedrooms. "Of all of the clients we've had, she was the most decisive we'd ever experienced when it came to color," says Springer. "Any option we presented to her she knew immediately which direction she wanted us to go. The rules were to remain warm and vibrant, and 'nothing flat and boring.'" 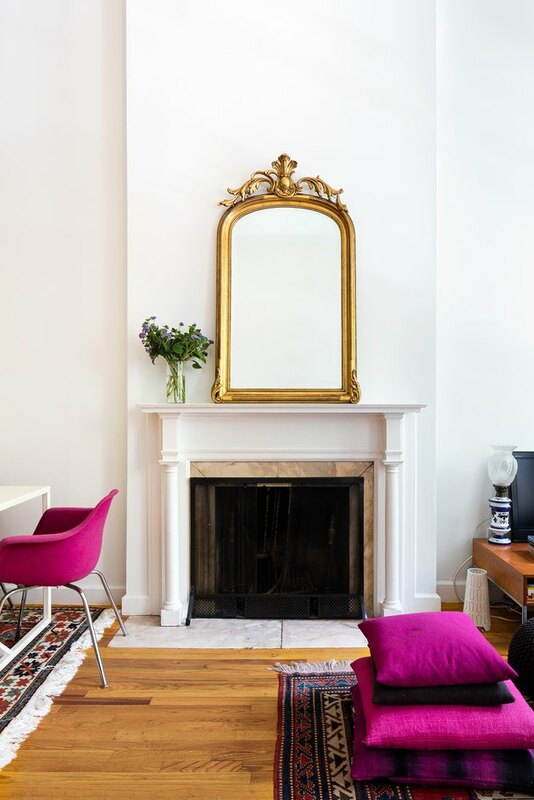 With an antique mirror, colorful accessories, and vintage pieces, the living room features that tough-to-achieve intellectual bohemian mix. 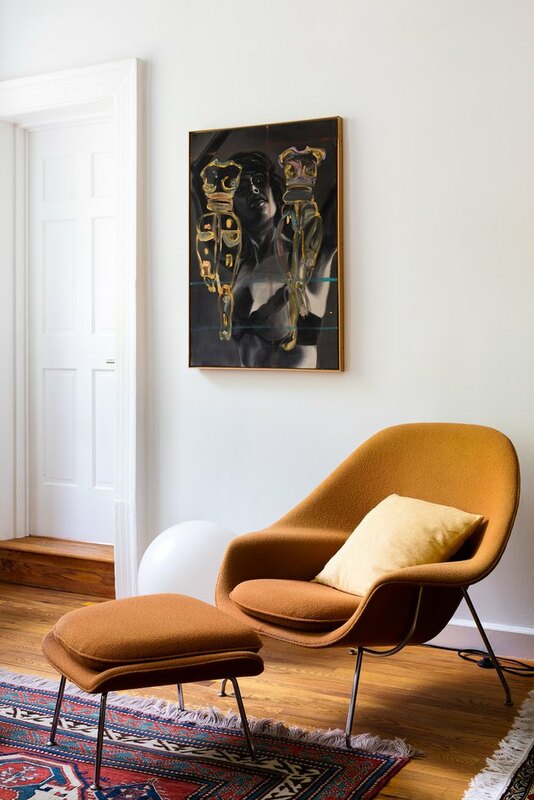 A painting by David Salle from the 1980s is displayed behind a Saarinen Womb chair and ottoman. "I was intrigued by the challenge of restoring a historic space such as this," says Theocharopoulou. "All the furniture is pieces I already had, I did not purchase any new furnishings. The antique rugs and my mother's portrait from the 1960s that I had just inherited give the interior a bright and very personal character." A corner of the main space was used for a dining area, where a mix of midcentury chairs surround a Blu Dot table. 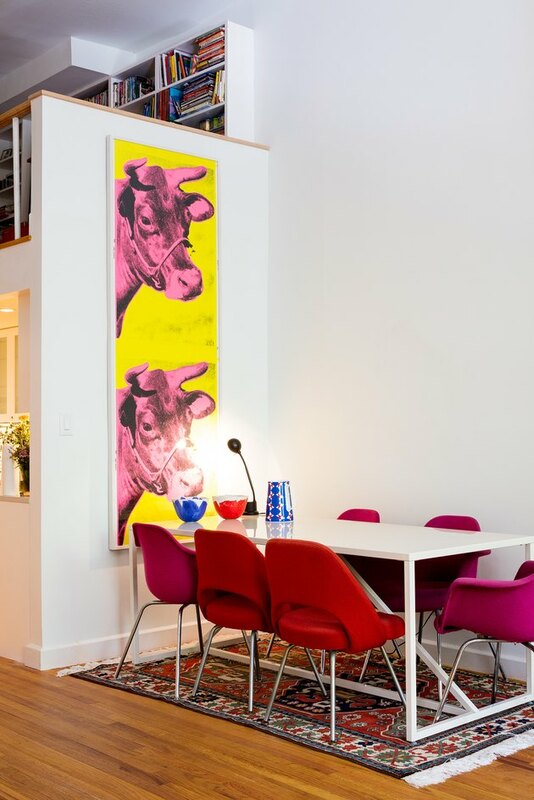 Theocharopoulou framed a piece of Andy Warhol's "Cow" wallpaper to create a large-scale piece. Above the dining area is a mezzanine office space. Theocharopoulou and architect Jonathan Man designed the custom cabinets, which were fabricated by Hatchet Design Build. 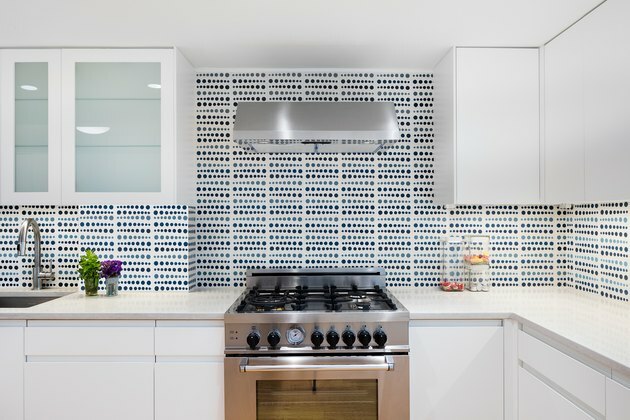 Cement tiles add color and pattern to the bright kitchen. 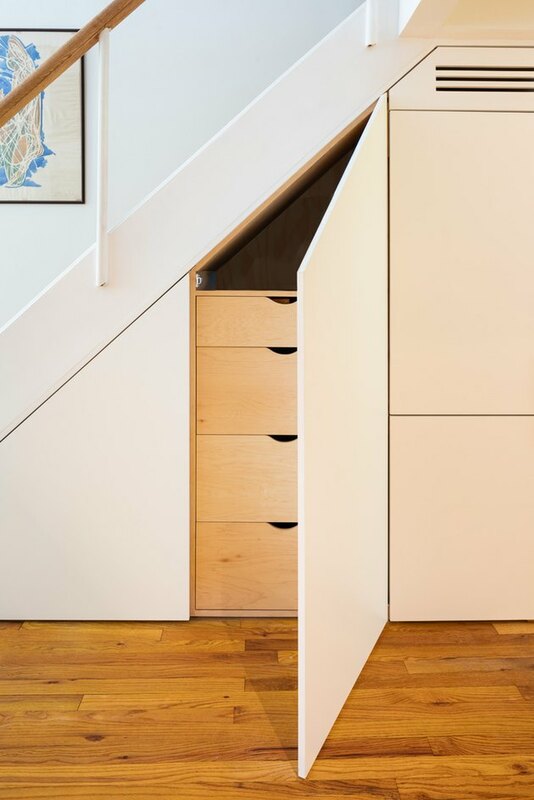 "We ended up doing a major rearrangement of the central core in order to tuck a pantry beneath the stairs, as well as additional built-in storage and the fridge," says Springer. "This ended up turning an active hallway into part of the kitchen. It was a cool move which created a ton of additional space, while allowing for a very utilitarian cooking space." Theocharopoulou chose a deep maroon wall color for the master bedroom, which was already outfitted with built-in storage when she moved in. "The existing space gave me the color palette: white walls for the main areas to accentuate north-facing light, selective areas of color in the bedrooms and study," she says. 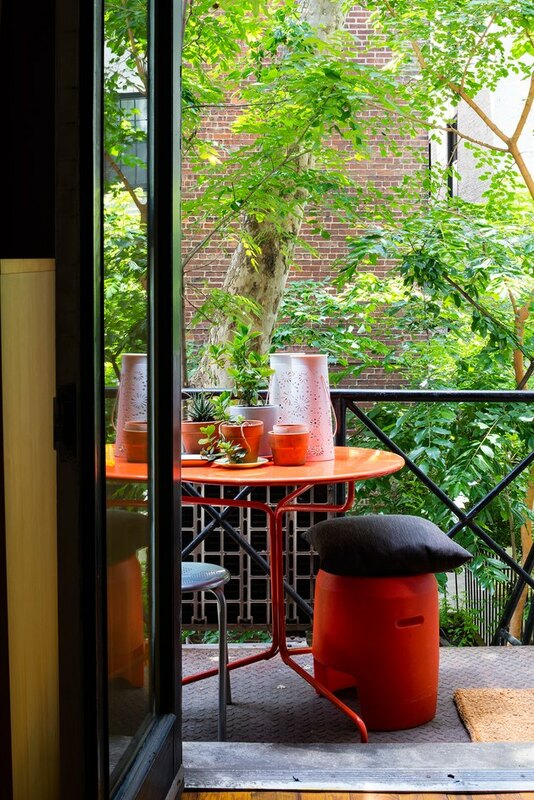 A vibrant orange table and stool sit on a small terrace outside the master bedroom. 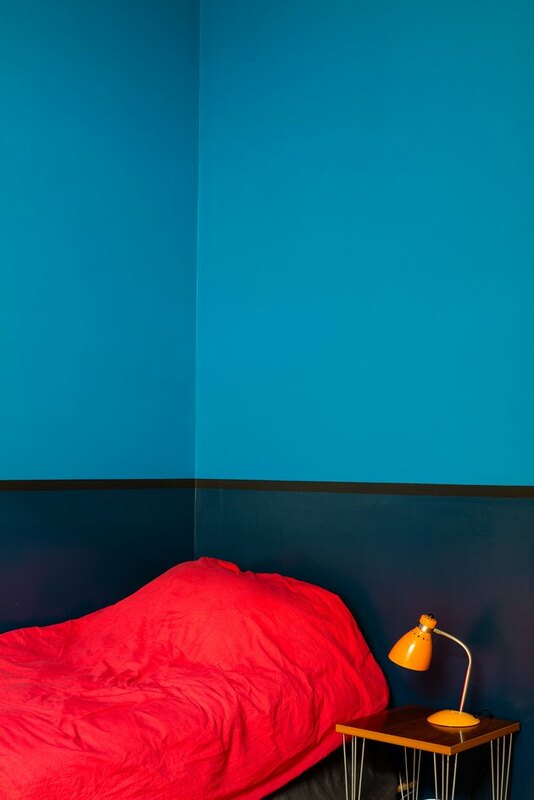 Deep blue hues were used on the walls of the son's bedroom. A red duvet and orange lamp complete the colorful space. 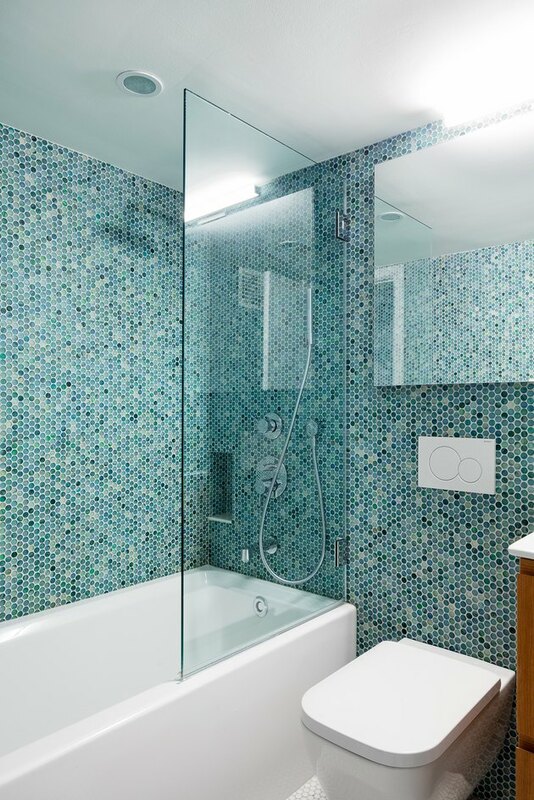 Recycled glass penny tiles in cool ocean hues were installed in the bathroom.